When you gaze out the window of your RV at the beautiful snow-kissed trees, the glistening icicles and the pretty snowflakes, you’ll quickly remember why you packed up the RV for a winter adventure. Winter outdoors is truly a wonderland! Here are some helpful tips to keep you and your RV crew warm and toasty on those frosty days this winter! A good rule of thumb for camping is to dress in layers. An even better rule of thumb for winter RVing is to equip your camper with ample bedding, quilts, warm winter clothing and thermal layers just in case you encounter furnace issues or your site doesn’t offer power hookups. Better yet, electric blankets can help you save on propane costs. Basking in the sun isn’t just for summer days. Parking your RV in the winter sunshine is an easy way to lock-in some warmth and natural light! Weather conditions can be unpredictable in the wintertime; a cold snap can quickly switch to warmer temperatures in just a matter of days. Next thing you know, a winter thaw could be on the horizon. Parking on support boards may help prevent your RV tires from sinking if the ground softens. Don’t forget to start your engine regularly to keep your RV batteries in check. You may want to look into outfitting your RV with solar panels for an extra reserve of energy. A cuppa warm tea or hot chocolate is the name of the game when winter camping. It’s a delicious way to keep warm on those chilly nights! Make sure to bring a coffee maker, French press or kettle along for the ride. One of the perks of winter RVing is the wonderland of snow sports at your doorstep! Don’t forget to bring your skis, skates, snowshoes and snowboards in tow. 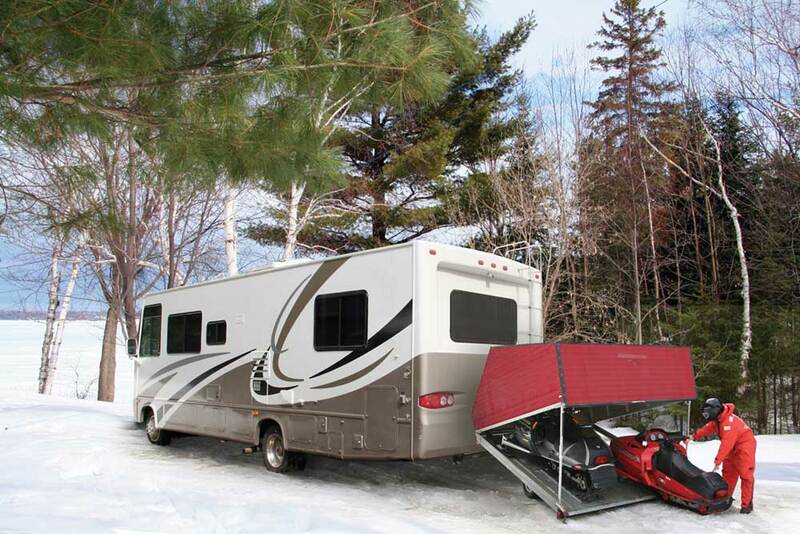 If snowmobiling is more your speed, consider getting a sport-utility RV – a Toy Hauler RV – which features ample cargo space and a swing-down ramp. For more handy how-to tips, read more about winter RV travel . Feeling inspired to map out your next road trip this winter? Get started with our handy RV Trip Planner.